In an hour or so I will finish packing up and head out to the JC Raulston Arboretum. My tomato stories will be shared with the Gardening Club of North Carolina, and once that is over, my 2018 speaking schedule will be complete. It is gratifying to end on a local event, and the contrast to my trip to Monticello to speak at the Heritage Harvest Festival perfectly sums up the joy in having opportunities to speak both near and far, smaller more intimate events and some of a pretty significant size. The size of the event and type of venue really have no relationship with the core meaning of speaking opportunities…building community and fellowship, sharing a passion, two-way learning, and most importantly, doing what I can to reach out and stimulate more people to get their hands dirty and grow something - in essence, to grow more gardeners. With the speaking part of the year about to be complete, things don’t become any less busy. 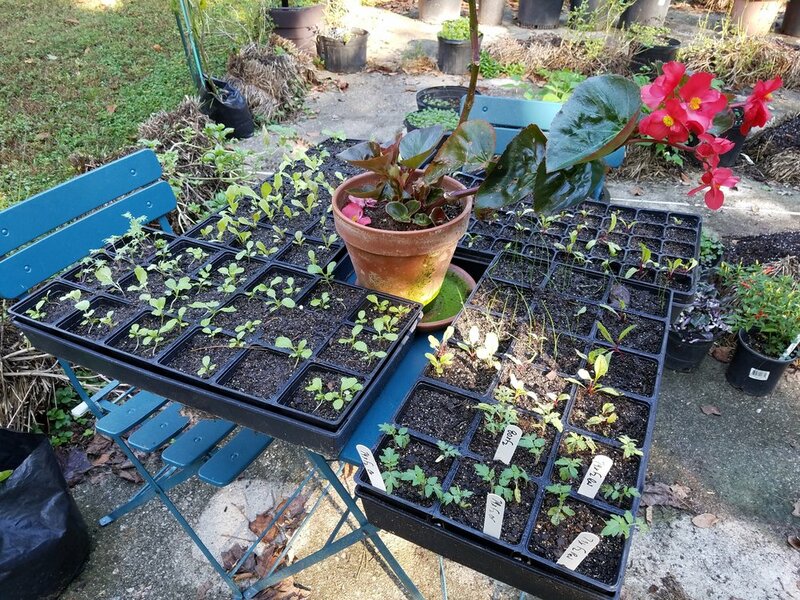 I’ve got four flats of young seedlings ready to be planted for a fall/winter/spring garden; among the plant types are collard, mustard, kale, lettuce, scallions, chard and beets. I’ve also got a few microdwarf tomatoes to tuck into small containers for some additional results for that particular mini-project. I am about to do a bit more seeking of speaking opportunities for next year, tucking a few additional events into an already busy schedule. I do look forward to meeting new gardening friends in places such as St Louis and Wayne County, near Detroit, as well as a return to Longwood Gardens. I am hoping to add Washington DC, and, perhaps, upstate New York. Work continues on the Dwarf Tomato project book (which will be book #3 for me), and that will keep me busy over the coming months. I remain undecided on ventures such as webinar training courses and a podcast - this is not a particularly energetic time of year for me, coming off a pretty intense summer of gardening….many will notice that I am less “out there” on social media, preferring to take a bit of a break to re-energize. I am about to have Carpal Tunnel surgery on my right hand, and the issues from that over the past few months are keeping me away from my laptop. Finally, loads of results from this year’s dwarf tomato project efforts need to be analyzed and sorted; I owe lots of people lots of seed samples from my very small Bouquet hot pepper efforts, and hope to get those packed and off over the coming month. I’ve yet to catalog in seeds from the dwarf project volunteers, and anticipate the arrival of much more. You should see my office - I can hardly step into it. I guess all of this adds up into my typical state of too much to do and not enough time to get to it all. Obviously, this is a state that I don’t mind, since it is a common thread throughout my life. Off I go to do one of my favorite things - telling heirloom tomato stories and sharing tips with an audience of enthusiastic gardeners at a wonderful venue. I do realize how lucky I am…it is the first thing that crosses my mind each morning. Older PostAfter the summer garden...what comes next?